Cala Ginepro, in the Orosei area, is a place like no other in Sardinia. The fine white sand, the gently sloping seabed, the crystal-clear water and the immaculate natural environment all combine to make this place very special indeed. Cala Ginepro is an enchanted destination not only for those who are looking for wide, sandy beaches stretching for mile after mile, but also for those who are enamoured of rocky coasts, since this “Juniper Cove” also features a stunning pink-granite reef. It is the ideal place for families with children, young people and everyone who simply loves nature. Camping Cala Ginepro has the privilege of being a campsite on the coast, with a full three access routes to the shore. From the campsite, the two routes fitted with walkways lead to the beaches of Cala Ginepro and Sa Mattanosa, whereas the third leads to the breathtaking reef. The thick forest in which the campsite is immersed, with its lush pine and eucalyptus trees, and of course its perfumed junipers, delineates what is a truly sublime scene, with the spellbinding turquoise sea enveloped by the perfumes of the Mediterranean maquis. This is an utterly incredible tract of coastline, surely amongst the most beautiful in all of Sardinia. Cala Ginepro beach is located adjacent to the Camping Cala Ginepro bar, with a dedicated direct access point. The equipped section, furnished with sunbeds and parasols, is flanked by large areas to which access is free of charge. On Cala Ginepro beach, you can hire various accessories to make the most of your day at the seaside, including canoes, windsurfing equipment, snorkelling gear and pedal boats. The wonderful transparency of the turquoise sea, the fine white sand, the gently sloping seabed and all of the facilities on offer at our campsite combine to make Cala Ginepro the ideal location for your Sardinian holiday. On Cala Ginepro beach, adults and children alike will have great fun, surrounded by an exceptionally beautiful natural paradise. 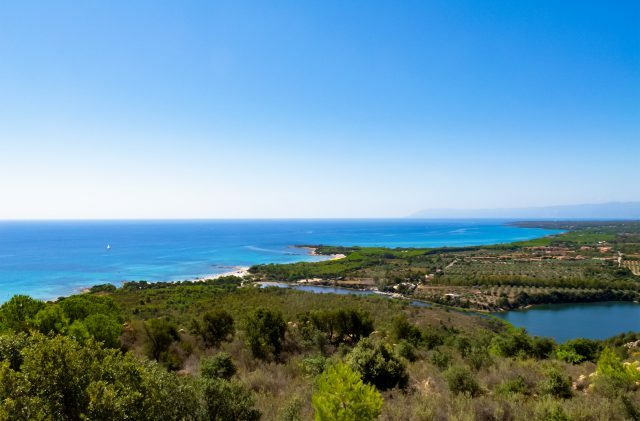 Various pitches look out over the Cala Ginepro reef, with direct access to the sea that separates the two white sandy beaches of Cala Ginepro and Sa Mattanosa. The reef extends for hundreds of metres, embraced by the dunes of Cala Ginepro and the luxuriant pine forest. There are several different ways to get across the reef: the coastal part offers easy access to the sea for those who love snorkelling or fishing, while the inland part features narrow trails both right behind the rocks and further back. Making your way along the reef gives you the chance to savour wonderful panoramas and unforgettable vistas, in a place infused with a profound sense of tranquillity. Surrounded by dense Mediterranean scrub and by numerous intensely aromatic herbs, a trip across the Cala Ginepro reef affords an opportunity for a natural aromatherapy experience. The fragrances of the mastic tree, sea daffodils, juniper, myrtle, chrithmum, rosemary, helichrysum and topped lavender will reawaken your senses and make you feel that you’re in the best spa in the world! Facing mainly eastwards, the spectacle of dawn from the reef is not to be missed. Sa Mattanosa beach is accessible from Camping Cala Ginepro, with direct access to the sea, near to the sports pitch. Having crossed the dunes in no time on the wooden walkway, you will be captivated by the shades of turquoise of the water gently lapping the wide stretch of fine white beach. The smooth sand and the shallow seabed make Sa Mattanosa beach ideal for children. Since it faces in a different direction from Cala Ginepro, you can be sure to find shelter from the wind whichever way it may be blowing, in relation to the currents. The south-facing Sa Mattanosa beach is sun-kissed until late in the evening. Indeed, particularly in spring and autumn, you cannot fail to be bewitched by the colours of the sunset, which make you feel that you are on a desert island – once the sun goes down, you simply turn round and you will see the campsite before you, with all of the amenities you could wish for. It is prohibited to leave boats or dinghies on the beach. There are no slipways to launch boats into the water. However, on Sa Mattanosa there is a tract of sea where, without assistance, you can take your vessel into the water. The current legislation requires that boats be moored at least 200 metres from the shore. Please consult the information provided by the Harbour Master’s Office to ensure that the law has not changed. Before turning your engine on you must always row out to a distance of at least 200 metres from the shore. Always take great care around bathers and respect the distance of 100 metres from the buoy of the scuba divers.